Calcium carbonate precipitate, lactose anhydrous, microcrystalline cellulose ph 101, magnesium stearate, butylated hydroxyanisole, butylated hydroxytoluene, croscarmellose sodium, colloidal silicon dioxide, hydroxypropyl methylcellulose, purified talc, titanium dioxide, dibutyl phathalate, hydroxypropyl cellulose. Calcium carbonate, maize starch, microcrystalline cellulose ph 101, sodium starch glycolate, colloidal silicon dioxide, purified talc, magnesium stearate, opadry II white. Calcium carbonate, lactose anhydrous, microcrystalline cellulose ph 101, magnesium stearate, croscarmellose sodium, butylated hydroxyanisole, butylated hydroxytoluene, colloidal silicon dioxide, hydroxypropylmethyl cellulose, purified talc, hydroxypropylmethyl cellulose, hydroxypropyl cellulose, dibutyl phthalate, titanium dioxide. ATOR is indicated as an adjunct to diet for reduction of elevated total cholesterol (total-C), LDL-cholesterol (LDL-C), apolipoprotein B, and triglycerides in adults, adolescents and children aged 10 years or older with primary hypercholesterolaemia including familial hypercholesterolaemia (heterozygous variant) or combined (mixed) hyperlipidaemia (corresponding to Types IIa and IIb of the Fredrickson classification) when response to diet and other nonpharmacological measures is inadequate. ATOR is also indicated to reduce total-C and LDL-C in adults with homozygous familial hypercholesterolaemia as an adjunct to other lipid-lowering treatments (e.g. LDL apheresis) or if such treatments are unavailable. Prevention of cardiovascular events in adult patients estimated to have a high risk for a first cardiovascular event, as an adjunct to correction of other risk factors. The patient should be placed on a standard cholesterol-lowering diet before receiving ATOR and should continue on this diet during treatment with ATOR. The dose should be individualised according to baseline LDL-C levels, the goal of therapy, and patient response. The Usual Starting Dose is: 10 mg once a day. Adjustment of dose should be made at intervals of 4 weeks or more. The maximum dose is 80 mg once a day. The majority of patients are controlled with ATOR 10 mg once a day. A therapeutic response is evident within 2 weeks, and the maximum therapeutic response is usually achieved within 4 weeks. The response is maintained during chronic therapy. Patients should be started with ATOR 10 mg daily. Doses should be individualised and adjusted every 4 weeks to 40 mg daily. Thereafter, either the dose may be increased to a maximum of 80 mg daily or a bile acid sequestrant may be combined with ATOR 40 mg once daily. Only limited data are available. The dose of ATOR in patients with homozygous familial hypercholesterolemia is 10-80 mg daily. ATOR should be used as an adjunct to other lipid-lowering treatments (e.g. LDL apheresis) in these patients or if such treatments are unavailable. In the primary prevention trials, the dose was 10 mg/day. Higher doses may be necessary in order to attain (LDL-) cholesterol levels according to current guidelines. Patients with renal impairment: No adjustment of dose is required. Patients with hepatic impairment: ATOR should be used with caution in patients with hepatic impairment. 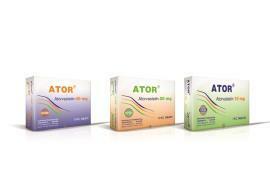 ATOR is contraindicated in patients with active liver disease. Use in the Elderly: Efficacy and safety in patients older than 70 years using recommended doses are similar to those seen in the general population. Pediatric use should only be carried out by physicians experienced in the treatment of pediatric hyperlipidaemia and patients should be re-evaluated on a regular basis to assess progress. For patients aged 10 years and above, the recommended starting dose of ATOR is 10 mg per day with titration up to 20 mg per day. Titration should be conducted according to the individual response and tolerability in pediatric patients. Safety information for pediatric patients treated with doses above 20 mg, corresponding to about 0.5 mg/kg, is limited. There is limited experience in children between 6-10 years of age. ATOR is not indicated in the treatment of patients below the age of 10 years. Other pharmaceutical forms/strengths may be more appropriate for this population. ATOR is for oral administration. Each daily dose of ATOR is given all at once and may be given at any time of day, with or without food. Hypersensitivity to the active substance or to any of the excipients in the product. Active liver disease or unexplained persistent elevations of serum transaminases exceeding 3 times the upper limit of normal. During pregnancy, while breast-feeding and in women of child-bearing potential not using appropriate contraceptive measures. Liver effects: Liver function tests should be performed before the initiation of treatment and periodically thereafter. Patients who develop any signs or symptoms suggestive of liver injury should have liver function tests performed. Patients who develop increased transaminase levels should be monitored until the abnormality(ies) resolves. Should an increase in transaminases of greater than 3 times the upper limit of normal (ULN) persist, reduction of dose or withdrawal of ATOR is recommended. ATOR should be used with caution in patients who consume substantial quantities of alcohol and/or have a history of liver disease. Stroke Prevention by Aggressive Reduction in Cholesterol Levels (SPARCL): In a post-hoc analysis of stroke subtypes in patients without coronary heart disease (CHD) who had a recent stroke or transient ischemic attack (TIA), there was a higher incidence of hemorrhagic stroke in patients initiated on atorvastatin 80 mg compared to placebo. The increased risk was particularly noted in patients with prior hemorrhagic stroke or lacunar infarct at study entry. For patients with prior hemorrhagic stroke or lacunar infarct, the balance of risks and benefits of atorvastatin 80 mg is uncertain, and the potential risk of hemorrhagic stroke should be carefully considered before initiating treatment. Skeletal muscle effects: Atorvastatin, like other HMG-CoA reductase inhibitors, may in rare occasions affect the skeletal muscle and cause myalgia, myositis, and myopathy that may progress to rhabdomyolysis, a potentially life-threatening condition characterised by markedly elevated creatine kinase (CK) levels (> 10 times ULN), myoglobinaemia and myoglobinuria which may lead to renal failure. ATOR should be prescribed with caution in patients with pre-disposing factors for rhabdomyolysis. Personal or familial history of hereditary muscular disorders. Previous history of muscular toxicity with a statin or fibrate. Previous history of liver disease and/or where substantial quantities of alcohol are consumed. In elderly (age > 70 years), the necessity of such measurement should be considered, according to the presence of other predisposing factors for rhabdomyolysis. Situations where an increase in plasma levels may occur, such as interactions and special populations including genetic subpopulations. In such situations, the risk of treatment should be considered in relation to possible benefit, and clinical monitoring is recommended. If CK levels are significantly elevated (> 5 times ULN) at baseline, treatment should not be started. Creatine Kinase measurement: Creatine Kinase (CK) should not be measured following strenuous exercise or in the presence of any plausible alternative cause of CK increase as this makes value interpretation difficult. If CK levels are significantly elevated at baseline (> 5 times ULN), levels should be re-measured within 5 to 7 days later to confirm the results. Patients must be asked to promptly report muscle pain, cramps, or weakness especially if accompanied by malaise or fever. If such symptoms occur whilst a patient is receiving treatment with ATOR, their CK levels should be measured. If these levels are found to be significantly elevated (> 5 times ULN), treatment should be stopped. If muscular symptoms are severe and cause daily discomfort, even if the CK levels are elevated to 5 x ULN, treatment discontinuation should be considered. If symptoms resolve and CK levels return to normal, then re-introduction of ATOR or introduction of an alternative statin may be considered at the lowest dose and with close monitoring. ATOR must be discontinued if clinically significant elevation of CK levels (> 10 x ULN) occur, or if rhabdomyolysis is diagnosed or suspected. Concomitant treatment with other medicinal products: Risk of rhabdomyolysis is increased when ATOR is administered concomitantly with certain medicinal products that may increase the plasma concentration of atorvastatin such as potent inhibitors of CYP3A4 or transport proteins (e.g. cyclosporine, telithromycin, clarithromycin, delavirdine, stiripentol, ketoconazole, voriconazole, itraconazole, posaconazole and HIV protease inhibitors including ritonavir, lopinavir, atazanavir, indinavir, darunavir, etc). The risk of myopathy may also be increased with the concomitant use of gemfibrozil and other fibric acid derivatives, erythromycin, niacin, ezetimibe, telaprevir, or the combination of tipranavir/ritonavir. If possible, alternative (non-interacting) therapies should be considered instead of these medicinal products. In cases where co-administration of these medicinal products with ATOR is necessary, the benefit and the risk of concurrent treatment should be carefully considered. When patients are receiving medicinal products that increase the plasma concentration of atorvastatin, a lower maximum dose of ATOR is recommended. In addition, in the case of potent CYP3A4 inhibitors, a lower starting dose of ATOR should be considered and appropriate clinical monitoring of these patients is recommended. The concurrent use of ATOR and fusidic acid is not recommended, therefore, temporary suspension of ATOR may be considered during fusidic acid therapy. Pediatric use: Developmental safety in the pediatric population has not been established. Interstitial lung disease: Exceptional cases of interstitial lung disease have been reported with some statins, especially with long term therapy. Presenting features can include dyspnoea, non-productive cough and deterioration in general health (fatigue, weight loss and fever). If it is suspected a patient has developed interstitial lung disease, statin therapy should be discontinued. Diabetes mellitus: Some evidence suggests that statins as a class raise blood glucose and in some patients, at high risk of future diabetes, may produce a level of hyperglycaemia where formal diabetes care is appropriate. This risk, however, is outweighed by the reduction in vascular risk with statins and therefore should not be a reason for stopping statin treatment. Patients at risk (fasting glucose 5.6 to 6.9 mmol/L, BMI > 30 kg/m2, raised triglycerides, hypertension) should be monitored both clinically and biochemically according to national guidelines. Excipients: ATOR contains lactose. Patients with rare hereditary problems of galactose intolerance, Lapp lactose deficiency or glucose-galactose malabsorption should not take this medicine. ATOR is metabolized by cytochrome P450 3A4 (CYP3A4) and is a substrate to transport proteins e.g. the hepatic uptake transporter OATP1B1. Concomitant administration of medicinal products that are inhibitors of CYP3A4 or transport proteins may lead to increased plasma concentrations of ATOR and an increased risk of myopathy. The risk might also be increased at concomitant administration of ATOR with other medicinal products that have a potential to induce myopathy, such as fibric acid derivates and ezetimibe. CYP3A4 inhibitors: Potent CYP3A4 inhibitors have been shown to lead to markedly increased concentrations of atorvastatin (see Table 1). Co-administration of potent CYP3A4 inhibitors (e.g. ciclosporin, telithromycin, clarithromycin, delavirdine, stiripentol, ketoconazole, voriconazole, itraconazole, posaconazole and HIV protease inhibitors including ritonavir, lopinavir, atazanavir, indinavir, darunavir, etc.) should be avoided if possible. In cases where co-administration of these medicinal products with ATOR cannot be avoided, lower starting and maximum doses of atorvastatin should be considered and appropriate clinical monitoring of the patient is recommended (see Table 1). Moderate CYP3A4 inhibitors (e.g. erythromycin, diltiazem, verapamil and fluconazole) may increase plasma concentrations of atorvastatin (see Table 1). An increased risk of myopathy has been observed with the use of erythromycin in combination with statins. Interaction studies evaluating the effects of amiodarone or verapamil on atorvastatin have not been conducted. Both amiodarone and verapamil are known to inhibit CYP3A4 activity and co-administration with ATOR may result in increased exposure to ATOR. Therefore, a lower maximum dose of ATOR should be considered and appropriate clinical monitoring of the patient is recommended when concomitantly used with moderate CYP3A4 inhibitors. Appropriate clinical monitoring is recommended after initiation or following dose adjustments of the inhibitor. CYP3A4 inducers: Concomitant administration of Ator with inducers of cytochrome P450 3A (e.g. efavirenz, rifampin, St. John's Wort) can lead to variable reductions in plasma concentrations of ATOR. Due to the dual interaction mechanism of rifampin, (cytochrome P450 3A induction and inhibition of hepatocyte uptake transporter OATP1B1), simultaneous co-administration of ATOR with rifampin is not recommended, as delayed administration of atorvastatin after administration of rifampin has been associated with a significant reduction in atorvastatin plasma concentrations. The effect of rifampin on atorvastatin concentrations in hepatocytes is, however, unknown and if concomitant administration cannot be avoided, patients should be carefully monitored for efficacy. Transport protein inhibitors: Inhibitors of transport proteins (e.g. ciclosporin) can increase the systemic exposure of atorvastatin (see Table 1). The effect of inhibition of hepatic uptake transporters on atorvastatin concentrations in hepatocytes is unknown. If concomitant administration cannot be avoided, a dose reduction and clinical monitoring for efficacy is recommended (see Table 1). Gemfibrozil/Fbric acid derivatives: The use of fibrates alone is occasionally associated with muscle-related events, including rhabdomyolysis. The risk of these events may be increased with the concomitant use of fibric acid derivatives and ATOR. If concomitant administration cannot be avoided, the lowest dose of ATOR to achieve the therapeutic objective should be used and the patients should be appropriately monitored. Ezetimibe: The use of ezetimibe alone is associated with muscle-related events, including rhabdomyolysis. The risk of these events may therefore be increased with concomitant use of ezetimibe and ATOR. Appropriate clinical monitoring of these patients is recommended. Colestipol: Plasma concentrations of atorvastatin and its active metabolites were lower (by approx. 25%) when colestipol was co-administered with atorvastatin. However, lipid effects were greater when atorvastatin and colestipol were co-administered than when either medicinal product was given alone. Fusidic acid: Interaction studies with atorvastatin and fusidic acid have not been conducted. As with other statins, muscle-related events, including rhabdomyolysis, have been reported in post-marketing experience with atorvastatin and fusidic acid given concurrently. The mechanism of this interaction is not known. Patients should be closely monitored and temporary suspension of ATOR treatment may be appropriate. Colchicine: Although interaction studies with atorvastatin and colchicine have not been conducted, cases of myopathy have been reported with atorvastatin co-administered with colchicine, and caution should be exercised when prescribing ATOR with colchicine. is necessary, do not exceed 10 mg ATOR daily. Clinical monitoring of these patients is recommended. In cases where co-administration with ATOR is necessary, lower maintenance doses of ATOR are recommended. At ATOR doses exceeding 20 mg, clinical monitoring of these patients is recommended. At ATOR doses exceeding 40 mg, clinical monitoring of these patients is recommended. Concomitant intake of large quantities of grapefruit juice and ATOR is not recommended. After initiation or following dose adjustments of diltiazem, appropriate clinical monitoring of these patients is recommended. Lower maximum dose and clinical monitoring of these patients is recommended. If co-administration cannot be avoided, simultaneous co-administration of ATOR with rifampin is recommended, with clinical monitoring. Lower starting dose and clinical monitoring of these patients is recommended. † Data given as x-fold change represent a simple ratio between co-administration and atorvastatin alone (i.e. 1-fold = no change). Data given as % change represent % difference relative to atorvastatin alone (i.e. 0% = no change). # See Warnings and Precautions and Drug Interactions for clinical significance. * Contains one or more components that inhibit CYP3A4 and can increase plasma concentrations of medicinal products metabolized by CYP3A4. Intake of one 240 ml glass of grapefruit juice also resulted in a decreased AUC of 20.4% for the active orthohydroxy metabolite. Large quantities of grapefruit juice (over 1.2 l daily for 5 days) increased AUC of atorvastatin 2.5 fold and AUC of active (atorvastatin and metabolites). ^ Total atorvastatin equivalent activity. Increase is indicated as “↑”, decrease as “↓”. OD = once daily; SD = single dose; BID = twice daily; QID = four times daily. Digoxin: When multiple doses of digoxin and 10 mg atorvastatin were co-administered, steady-state digoxin concentrations increased slightly. Patients taking digoxin should be monitored appropriately. Oral contraceptives: Co-administration of atorvastatin with an oral contraceptive produced increases in plasma concentrations of norethindrone and ethinyl oestradiol. Warfarin: In a clinical study in patients receiving chronic warfarin therapy, co-administration of atorvastatin 80 mg daily with warfarin caused a small decrease of about 1.7 seconds in prothrombin time during the first 4 days of dosing which returned to normal within 15 days of atorvastatin treatment. Although only very rare cases of clinically significant anticoagulant interactions have been reported, prothrombin time should be determined before starting ATOR in patients taking coumarin anticoagulants and frequently enough during early therapy to ensure that no significant alteration of prothrombin time occurs. Once a stable prothrombin time has been documented, prothrombin times can be monitored at the intervals usually recommended for patients on coumarin anticoagulants. If the dose of ATOR is changed or discontinued, the same procedure should be repeated. Atorvastatin therapy has not been associated with bleeding or with changes in prothrombin time in patients not taking anticoagulants. Patients taking digoxin should be monitored appropriately. † Data given as % change represent % difference relative to atorvastatin alone (i.e. 0% = no change). * Co-administration of multiple doses of atorvastatin and phenazone showed little or no detectable effect in the clearance of phenazone. OD = once daily; SD = single dose. Pediatric population: Drug-drug interaction studies have only been performed in adults. The extent of interactions in the pediatric population is not known. The above-mentioned interactions for adults and the warnings in Warnings and Precautions should be taken into account for the pediatric population. Women of child-bearing potential should use appropriate contraceptive measures during treatment. ATOR is contraindicated during pregnancy. Safety in pregnant women has not been established. No controlled clinical trials with atorvastatin have been conducted in pregnant women. Rare reports of congenital anomalies following intrauterine exposure to HMG-CoA reductase inhibitors have been received. Animal studies have shown toxicity to reproduction. Maternal treatment with atorvastatin may reduce the fetal levels of mevalonate which is a precursor of cholesterol biosynthesis. Atherosclerosis is a chronic process, and ordinarily discontinuation of lipid-lowering medicinal products during pregnancy should have little impact on the long-term risk associated with primary hypercholesterolaemia. For these reasons, ATOR should not be used in women who are pregnant, trying to become pregnant or suspect they are pregnant. Treatment with ATOR should be suspended for the duration of pregnancy or until it has been determined that the woman is not pregnant. It is not known whether atorvastatin or its metabolites are excreted in human milk. In rats, plasma concentrations of atorvastatin and its active metabolites are similar to those in milk. Because of the potential for serious adverse reactions, women taking ATOR should not breastfeed their infants. ATOR is contraindicated during breastfeeding. In animal studies, atorvastatin had no effect on male or female fertility. ATOR has negligible influence on the ability to drive and to use machines. Based on data from clinical studies and extensive post-marketing experience, the following is the adverse reaction profile for atorvastatin. Estimated frequencies of reactions are ranked according to the following convention: Common (> 1/100, < 1/10); Uncommon (> 1/1,000, < 1/100); Rare (> 1/10,000, < 1/1,000); Very rare (> 1/10,000). Uncommon: Hypoglycaemia, weight gain, anorexia. Uncommon: Dizziness, paraesthesia, hypoesthesia, dysgeusia, amnesia. Common: Constipation, flatulence, dyspepsia, nausea, diarrhoea. Uncommon: Vomiting, upper and lower abdominal pain, eructation, pancreatitis. Uncommon: Urticaria, skin rash, pruritus, alopecia. Rare: Angioneurotic oedema, bullous dermatitis including erythema multiforme, Stevens-Johnson syndrome and toxic epidermal necrolysis. Common: Myalgia, arthralgia, pain in extremity, muscle spasms, joint swelling, back pain. Uncommon: Neck pain, muscle fatigue. Rare: Myopathy, myositis, rhabdomyolysis, tendonopathy, sometimes complicated by rupture. Uncommon: Malaise, asthenia, chest pain, peripheral oedema, fatigue, pyrexia. Common: Abnormal liver function test, increased blood creatine kinase. Uncommon: Positive white blood cells urine test. As with other HMG-CoA reductase inhibitors, elevated serum transaminases have been reported in patients receiving Atorvastatin. These changes were usually mild, transient, and did not require interruption of treatment. Clinically important (> 3 times upper normal limit) elevations in serum transaminases occurred in 0.8% patients on Atorvastatin. These elevations were dose-related and were reversible in all patients. Elevated serum creatine kinase (CK) levels greater than 3 times upper limit of normal occurred in 2.5% of patients on atorvastatin, similar to other HMG-CoA reductase inhibitors in clinical trials. Levels above 10 times the normal upper range occurred in 0.4% atorvastatin-treated patients. Common: Increased alanine aminotransferase, increased blood creatine phosphokinase. Based on the data available, frequency, type and severity of adverse reactions in children are expected to be the same as in adults. There is currently limited experience with respect to long-term safety in the paediatric population. Exceptional cases of interstitial lung disease, especially with long term therapy. Diabetes mellitus: Frequency will depend on the presence or absence of risk factors (fasting blood glucose 5.6 mmol/L, BMI > 30 kg/m2, raised triglycerides, history of hypertension). Specific treatment is not available for atorvastatin overdose. If an overdose occurs, the patient should be treated symptomatically and supportive measures instituted, as required. Liver function tests should be performed and serum CK levels should be monitored. Due to extensive atorvastatin binding to plasma proteins, haemodialysis is not expected to significantly enhance atorvastatin clearance. Pharmacotherapeutic group: Lipid modifying agents, HMG-CoAreductase inhibitors. Atorvastatin is a selective, competitive inhibitor of HMG-CoA reductase, the rate-limiting enzyme responsible for the conversion of 3-hydroxy-3-methyl-glutaryl-coenzyme A to mevalonate, a precursor of sterols, including cholesterol. Triglycerides and cholesterol in the liver are incorporated into very low-density lipoproteins (VLDL) and released into the plasma for delivery to peripheral tissues. Low-density lipoprotein (LDL) is formed from VLDL and is catabolized primarily through the receptor with high affinity to LDL (LDL receptor). Atorvastatin lowers plasma cholesterol and lipoprotein serum concentrations by inhibiting HMG-CoA reductase and subsequently cholesterol biosynthesis in the liver and increases the number of hepatic LDL receptors on the cell surface for enhanced uptake and catabolism of LDL. Atorvastatin reduces LDL production and the number of LDL particles. Atorvastatin produces a profound and sustained increase in LDL receptor activity coupled with a beneficial change in the quality of circulating LDL particles. Atorvastatin is effective in reducing LDL-C in patients with homozygous familial hypercholesterolaemia, a population that has not usually responded to lipid-lowering medicinal products. Atorvastatin has been shown to reduce concentrations of total-C (30%-46%), LDL-C (41%-61%), apolipoprotein B (34%-50%), and triglycerides (14%-33%) while producing variable increases in HDL-C and apolipoprotein A1 in a dose response study. These results are consistent in patients with heterozygous familial hypercholesterolaemia, nonfamilial forms of hypercholesterolaemia, and mixed hyperlipidaemia, including patients with non-insulin-dependent diabetes mellitus. Reductions in total-C, LDL-C, and apolipoprotein B have been proven to reduce risk for cardiovascular events and cardiovascular mortality. Absorption: Atorvastatin is rapidly absorbed after oral administration; maximum plasma concentrations (Cmax) occur within 1 to 2 hours. Extent of absorption increases in proportion to atorvastatin dose. After oral administration, atorvastatin film-coated tablets are 95% to 99% bioavailable compared to the oral solution. The absolute bioavailability of atorvastatin is approximately 12% and the systemic availability of HMG-CoA reductase inhibitory activity is approximately 30%. The low systemic availability is attributed to presystemic clearance in gastrointestinal mucosa and/or hepatic first-pass metabolism. Distribution: Mean volume of distribution of atorvastatin is approximately 381 l. Atorvastatin is 98% bound to plasma proteins. Biotransformation: Atorvastatin is metabolized by cytochrome P450 3A4 to ortho- and parahydroxylated derivatives and various beta-oxidation products. Apart from other pathways, these products are further metabolized via glucuronidation. In vitro, inhibition of HMG-CoA reductase by ortho- and parahydroxylated metabolites is equivalent to that of atorvastatin. Approximately 70% of circulating inhibitory activity for HMG-CoA reductase is attributed to active metabolites. Elimination: Atorvastatin is eliminated primarily in bile following hepatic and/or extrahepatic metabolism. However, atorvastatin does not appear to undergo significant enterohepatic re-circulation. Mean plasma elimination half-life of atorvastatin in humans is approximately 14 hours. The half-life of inhibitory activity for HMG-CoA reductase is approximately 20 to 30 hours due to the contribution of active metabolites. Elderly: Plasma concentrations of atorvastatin and its active metabolites are higher in healthy elderly subjects than in young adults while the lipid effects were comparable to those seen in younger patient populations. Gender: Concentrations of atorvastatin and its active metabolites in women differ from those in men (Women: approx. 20% higher for Cmax and approx. 10% lower for AUC). These differences were of no clinical significance, resulting in no clinically significant differences in lipid effects among men and women. Patients with renal impairment: Renal disease has no influence on the plasma concentrations or lipid effects of atorvastatin and its active metabolites. Patients with hepatic impairment: Plasma concentrations of atorvastatin and its active metabolites are markedly increased (approx. 16-fold in Cmax and approx. 11-fold in AUC) in patients with chronic alcoholic liver disease (Child-Pugh B). SLOC1B1 polymorphism: Hepatic uptake of all HMG-CoA reductase inhibitors including atorvastatin, involves the OATP1B1 transporter. In patients with SLCO1B1 polymorphism, there is a risk of increased exposure of atorvastatin, which may lead to an increased risk of rhabdomyolysis. Polymorphism in the gene encoding OATP1B1 (SLCO1B1 c.521CC) is associated with a 2.4-fold higher atorvastatin exposure (AUC) than in individuals without this genotype variant (c.521TT). A genetically impaired hepatic uptake of atorvastatin is also possible in these patients. Possible consequences for the efficacy are unknown. ATOR 10 mg Tablets : Box containing 1 strip of 7 tablets. ATOR 20 mg Tablets : Box containing 1 strip of 7 tablets. ATOR 40 mg Tablets : Box containing 1 strip of 7 tablets. ATOR 80 mg Tablets : Box containing 1 strip of 7 tablets.